The Revolution swivel shower chair is the perfect solution for a user that requires assistance getting in and out of a tub or shower. This industry leading product features an integrated swivel mechanism that allows for quick and comfortable pivoting of a user for showering. Users can safely and conveniently access the Revolution by Raising the pivoting armrest or sit directly into the seat. The user can then swivel themselves to a comfortable position within a shower or bathtub for a gentle shower without excessive splash into their face. Designed with height adjustable legs and narrow base, the Revolution can integrate into almost any shower setting including a standard tub. With suction base grips and all aluminum construction, the Revolution is a sturdy, cost effective, comfortable companion for client or resident showering. Designed by safe patient handling experts, this chair comes with a 100% customer satisfaction guarantee. 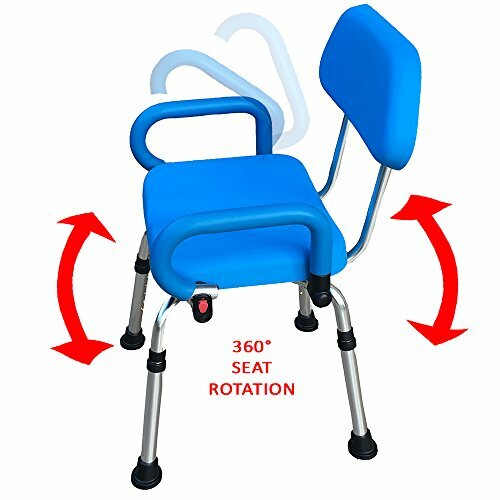 The Revolution chair is a professional grade product that is used daily in Hospitals and nursing homes worldwide by professional caregivers and their patients. Home-care clients regularly praise the Revolution as one of their best investments in bathroom safety and convenience- a testament to the design, quality and functionality of this best-in-class product. Specifications overall height: 43" overall width: 22" distance from floor to seat: 21.25" seat depth: 15.75" seat width (between armrests): 18" backrest height: 20.5" backrest width: 14".